If you’re looking to improve your weightlifting for CrossFit, you came to the right place. 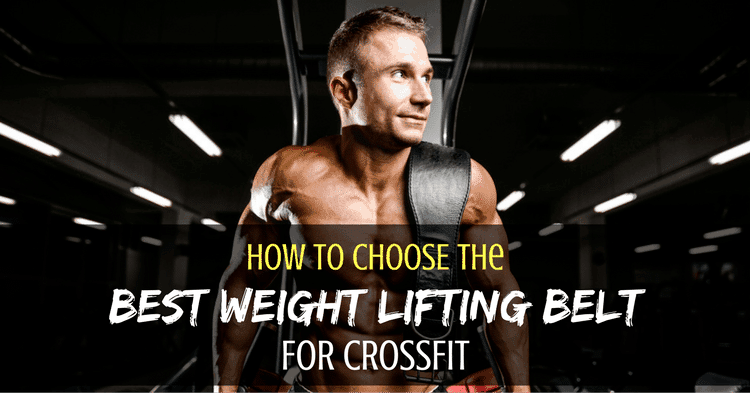 We’ve spent hours reviewing hundreds of different products and we came up with a thorough discussion of weightlifting belts for CrossFit and 5 of the most popular products on the market. For more of my top CrossFit accessories recommendations, have a look through these popular KAHG guides: Gloves, Hand Grips, Wrist Wraps, and Gym Bags. 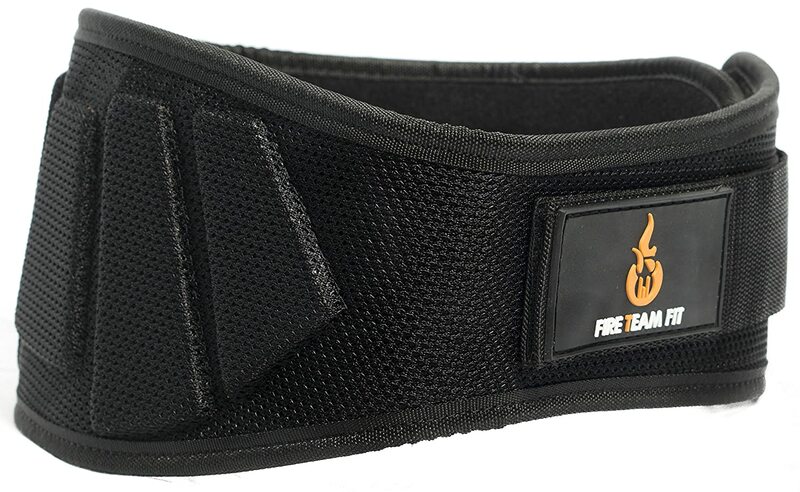 The Fire Team weight lifting belt is different from most powerlifting belts as it is Velcro-fastened. But don’t let that fool you. It will offer just the same amount of support on your back as any other products and provides a totally adjustable tightness. The Velcro feature will help to set just the right amount of tightness you want around your midsection. This means no more getting stuck between belt holes! Especially in CrossFit, a type of training that will require different levels of support, this can be useful on the fly. We’ve actually put this belt on the scale and it weighs just over half a pound which is very light. So, it’s easy to adjust, easy to carry around and offers good support to both the back and the abdominals. On the other hand, this doesn’t provide the same double-fastening Velcro mechanism that we’ve seen with other products, which can make it challenging for max effort singles in the clean or squat. It’s also relatively pricey, which is a relevant concern. 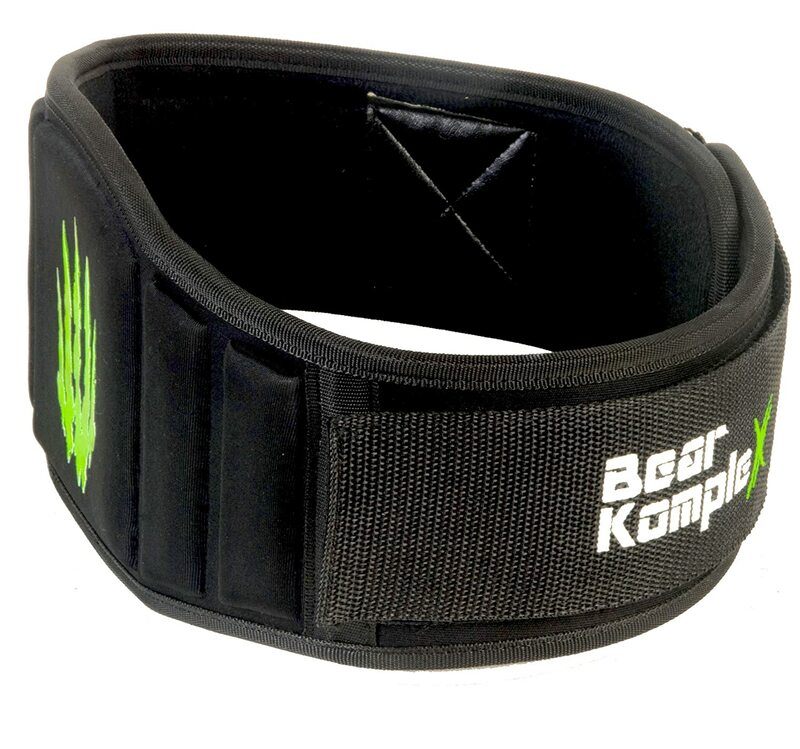 The amount of support you get from Bear KompleX feels just like a traditional prong and clasp belt, but with less stiffness at the front and an easier time making adjustments. You will get similar benefits to a heavy-duty leather belt, but with the comfort of a nylon one and the adjustability of Velcro. Even though it is stiffer than other foam/nylon belts in our list it still feels comfortable enough and the edges will not get into your abs or torso when you squat or deadlift. The width is around 5 inches, which is just a little bit above average. As with the previous Velcro belt, the lack of double-loop fastening mechanism does hold this back. The finish is decent enough, but the design feels like it needed a little bit more work. Price-wise, this will be sitting at the higher end of the range, but the quality and value are definitely there. The design needs more work. The fastening mechanism could be stronger. The Harbinger is an ultra-lightweight weightlifting for CrossFit which features a steel buckle and a Velcro closure that features a double-loop mechanism. 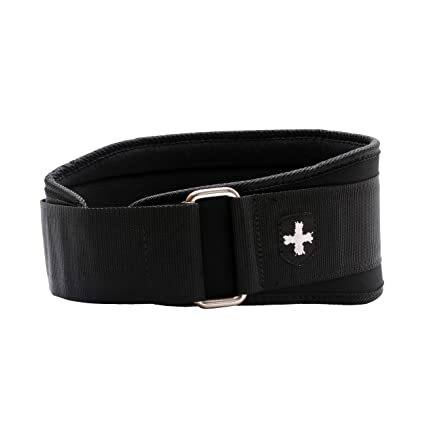 It is 5 inches wide – which puts it right in the middle range of the weight lifting belts widths. Just as any other Velcro-based belt, the adjustment is quick and precise, the support is good, and it feels very comfortable. The belt is made out of a foam-like material which seems to be sensitive to folding. You might want to either leave it straight as it is or just roll it up when you have it in your gym bag, or you’ll prematurely age the belt. We are surprised to see this product positioned at the lower end of the pricing range. It definitely doesn’t feel like a low-end weightlifting belt. Even though it might be a lighter material, it can take on a lot of mileage if you take good care of it. One potential downside is the sizing. Many users have reported problems picking the right size based on the chart provided by the manufacturer. You might want to go 1 or even 2 sizes up to make sure it will fit your waist. 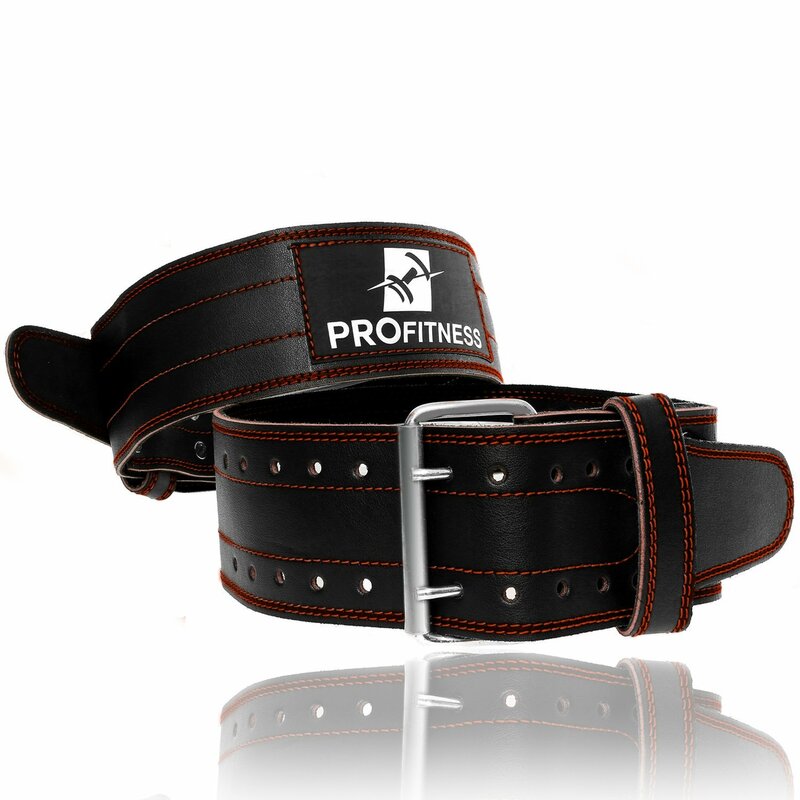 Being a leather Powerlifting belt, you will feel far more rigid. The increased rigidity and stiffness make it ideal for heavy singles in a powerlifting style – whether for squats or deadlifts. However, this product is totally inappropriate for weightlifting movements: the edges may cause some discomfort, digging into the ribs area or hips during cleans or front squats. This makes it very limited in its application, so it may only be useful for the powerlifts. The red stitching on this belt looks totally awesome, but it also comes with white coloured stitching if you don’t like red. The inside of the belt has a different finish which offers really good adherence, and also feels comfortable on the skin. 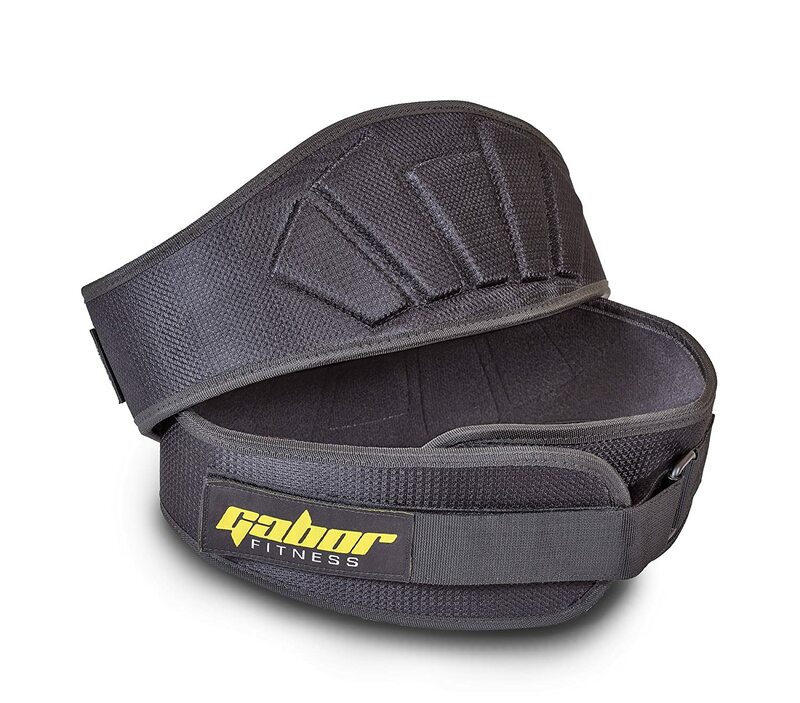 The Gabor Fitness weightlifting belt is great if you just want to go through your beginner WOD with a little bit of extra support around your back. This is probably one of the lightest and cheapest belts you can buy: chances are you will not even feel you have it on – it’s that comfortable. Of course, if you are more advanced and thinking about hitting a PR with it, you might want to consider a different belt. The amount of support on the Gabor belt is decent, but it probably won’t be enough if you’re really pushing yourself to a maximum effort. Other than that, there’s plenty of Velcro to keep it tight no matter what, but the steel buckle seems feeble. Also, there seem to be some issues with the sizing chart – most users reported that they needed to go one size up to actually have this belt fit. It comes together with a protective bag you can use to carry it around which is great if you want to extend the life of this essential piece of kit. These belts are made out of genuine leather or a combination of nylon and a foam-like material. The main purpose of these belts is to offer lower back support and prevent injuries when the user is engaged in weightlifting exercises. A weight lifting belt for CrossFit particularly will be a tiny bit less bulky and maybe thinner than a weight lifting belt you would see a powerlifter use. This allows greater mobility and makes the belt wearable though longer workouts or even when performing stretching exercises. There is a debate on whether weight lifting belts are any good or not, especially for CrossFit. The simple truth is that a belt that is used well is going to be beneficial but used poorly it can increase risk. Make sure you’re not using the belt to hide a weak core/back! The number one reason for which athletes use a weight lifting belt for CrossFit is to prevent injuries, with the lower back injury being the most common in CrossFit. Using heavy weights can put a lot of pressure on your back if you don’t have good form. We all know you will have one or two bad form reps every now and then. That happens when you least expect it and it can happen to anyone. You never know when that’s going to happen, but you definitely want to have your belt on when it does. Better core stability will allow you to push (or pull) more weight with a strong, taut core. If you’re struggling with a flaccid midsection in the squat or deadlift, the belt can be a good accompaniment, alongside improved technique. The belt isn’t just a way of assisting your core during the lifts – it provides a way to build stronger abs and back muscles when you’re not wearing the belt. The point of the belt is to provide resistance for the core muscles, a key aspect of improving strength. This allows you to build stronger core muscles which will be useful both with and without the belt itself. At first, all belts will look similar, but there are a handful of characteristics that can make or break a weightlifting belt. Once you are aware of these characteristics, getting the best belt is pretty straightforward. Here’s what you should keep in mind when shopping. The first thing you want to look at is the fabric or the material the belt is made of. There aren’t that many options here: you have the full-leather belts and the nylon/foam belts. The main difference between the two is that leather belts are more supportive, but they can’t use a Velcro attachment. They tend to use a buckle system, which is more resilient than their Velcro counterparts. The upside is that they will offer better torso support which is extremely important when you are lifting really, really heavy. They are also very comfortable when using the right type of leather: a powerlifting belt will be very stiff, but a proper weightlifting belt will use supportive-but-supple leather. Nylon and foam belts are much lighter and very comfortable to wear. They are smaller, take up less space and you can wear them throughout your entire workout without too much discomfort. The torso support you will get from nylon/foam belts will depend on their width and thickness. You may have belts that will offer more or less support – which is why these are great for beginners and intermediate users. Next thing on the list is the type of closure used on the belt – it can be the old-school type with a clamp and buckle, or it can be a Velcro. The main thing you want to keep in mind here is that setting up your belt should be easy, quick and precise. This is especially important if you put on and take off your belt a lot during your workouts. A high-quality Velcro will work wonders for CrossFit’s mixed demands and fast transitions. It’s super easy and quick to tie and untie, and more importantly, it is much more adjustable: you can tighten or loosen up the belt as you desire. On the other hand, the buckled belts will take a bit more time to tie and untie, and the level of tightness will be limited by the number of holes and the distance between them. You may even find yourself making new holes in your belt in order to get the tightness right. However, the resilience and tightness of a conventional buckle is much greater than a Velcro fastening, which makes it more appropriate for heavy lifting – especially in the squat, clean, and deadlift. Most weightlifting belts have a width between 4 and 6 inches. The wider the belt, the better the support, right? Well, not necessarily. Really wide belts can be uncomfortable to wear simply because they will get in the way of your ribcage and hips during squatting movements. You would probably be better off with a belt which is firm enough to offer support and not so wide. Something in-between 4 to 5 inches should work great. The thickness of the belt will also affect both the comfort and the support. Generally speaking, a thicker belt will offer more support, but it can also be really uncomfortable. Thick belts are often very rigid, with very little ‘give’ during squats and other movements. This can be a concern, depending on how you squat, and how important weightlifting movements are for your training. Weightlifting belt come in standard sizes and are allowed up to 13mm thickness, while powerlifting belts are often much thicker. However, this type of belt is inappropriate for CrossFit due to the involvement of Olympic lifting movements in the competitive format. This one is super important if you plan on using the belt a lot. Check out things such as the stitching, the buckle size, inner padding and so on and so forth. All these should look spot on because you will be putting a lot of pressure on all these materials when you tie and untie your belt. You want to see double or triple stitching, no loose ends. The buckle should look/feel solid and the inner padding should allow you to use the belt directly on your skin without causing any rashes or discomfort. Remember that powerlifting belts do not allow any padding at all. Obviously, you want to get the right size, which should be pretty straightforward. All manufacturers offer these charts which are going to help you pick the right size based on your waist measurements. Some vendors managed to screw these charts up if you are somewhere towards the upper or lower limit of a sizing, you can end up picking a belt which will not fit you – check existing user reviews to see if this is going to be a problem. The only thing you can do here is get in touch with another user which has measurements similar to yours and ask which size you should get. It’s as simple as that, just don’t always trust the vendor charts. Lastly but not least you want to check out the pricing as well. A decent weight lifting belt for CrossFit will set you back $30-$40, but there are options that offer a bargain or fantastic quality outside of this range. Expensive options that provide maximal support and comfort can cost $65 while cheaper, $20-30 options will provide less quality but cost far less. Find something that balances your need for value with function. A good belt will help you step up your weight lifting game. It will help you make progress faster, prevent injuries and build stronger core muscles. Pick the right one based on your personal situation and take your workouts to the next level, but remember that it’s only assistive: your technique, posture and core strength are all crucial.